It's mid November and the Christmas decorations have begun to pop up everywhere. It's time to think of Christmas gifts, party outfits, and what to do on New Year's Eve. 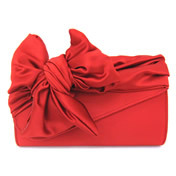 Isn't this clutch perfect for a Christmas party??? It's the " Mini Clutch ruban wire red" by Sarah's Bag.